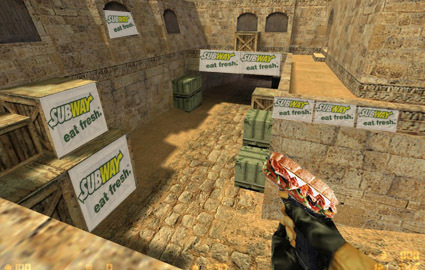 Any counterstrike player will be familiar with the experience of joining a server, loading up the map, and seeing a few changes. Like seeing aÂ massive floating banner for whatever clan it is that runs the server. Normally these are just a minor irritation. But Engage has taken it one step further, selling in-game advertising to major companies. It seems Engage put themselves in a lose-lose situation. They alienated people playing on their servers, so now won’t get any more ad revenue; and they pissed off Valve, who aren’t exactly known ot be forgive-and-forget (lest we forget the 30,000 accounts banned just before Christmas 2004). Still, its nice to see a company shoot itself in both feet when they try and make a quick buck through advertising. As good a story as this is, I think its bogus. It just seems far too far-fetched for anyone to do this, and noone is that stupid. Also, the changes looks pretty sketchy (roll for a gun? ), I just think it is some guy playing a joke. Do you have the original site you got it from?